THE GOLDBERGS: I really love when Bev and Erica bond. The duo helping each other out of their funk was perfectly true to them and also funny. CHICAGO MED: Ava doubling down on her lie feels really gross. And given the build-up to Ava and Conner getting together, what a weird choice to have them (seemingly) end like this. The patients were particularly tough this week, as the mother who wanted her daughter to have surgery—which could kill her grandchild—was heartbreaking. And the young boy who tried to kill himself? Absolutely brutal. RIVERDALE: The Gargoyle King reveal felt very anticlimactic. FP as the Sheriff feels weird…wonder how long that’s going to last? Okay, and was anyone else thinking of Dylan McKay’s issues with standardized testing when Archie walked out? I know they’re different characters, but I wanted Luke Perry’s Fred to make a joke about it. 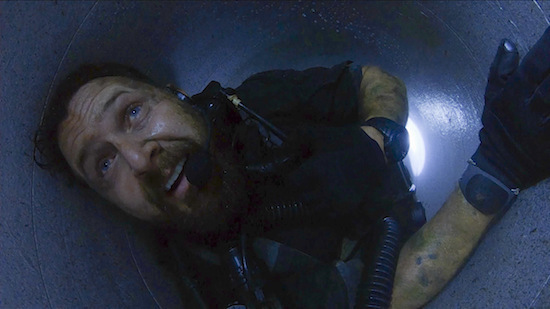 SEAL TEAM: Sonny referencing STAR WARS while trapped was kind of perfect. But goodness, being trapped in that small tube and having it fill up with water? What a freaking nightmare. But it led to probably the best episode of the series. The entire cast shone, but wow, A.J. Buckley did a great job in the episode—both of what we could see of him confined in the tube, but also his pleas, jokes, meltdown, and occasional weakness via the walkie was an incredible display. CHICAGO FIRE: Ugh, I’m so glad Casey and the team are persistent in finding out the truth about what happens to people. I’m glad that young man got to know the truth about his father’s death. I love how supportive Trudy is of Mouch. THE MASKED SINGER: It’s going to get more difficult as the weeks go on to peg who will go home. The clues for the Poodle were some of the toughest so far—I still don’t get how half of them tie into the revealed person—but a few of the contestants seem a bit more solid (Ricki Lake), whereas others are a little more muddled (hmm, to the Rabbit). YOU’RE THE WORST: I love Gretchen, but my goodness, working for her would be an absolute nightmare. It’s kind of sad she didn’t realize she had the perfect assistant right there by the end. CHICAGO P.D. : So, um, are we going to go back to the ramifications of Dawson’s addiction/accidental kill? But, yikes, Halstead. I get where he was coming from in trying to get the answer about the dead girl, and it was probably a lost cause, but call for the freaking ambulance so you don’t lose the answer forever. And Voight’s reaction in the final scene, after the gunshot, was absolutely brutal.